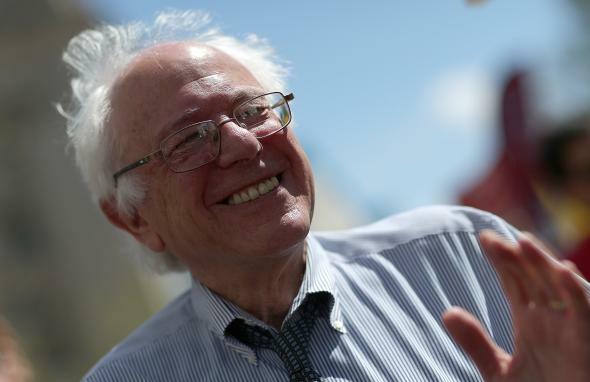 Bernie Sanders 2016: The Vermont socialist isn’t a legitimate contender, but he’s a serious candidate. Sen. Bernie Sanders participates in a march organized by the group Campaign for America’s Future on April 20, 2015, in Washington, D.C.
Sanders is already proving correct on the first count. His nascent campaign has gained more steam in its first month than many expected it would in its first year. As the Washington Post points out, the Vermont senator’s presidential campaign now has more support than those of Lindsey Graham, Bobby Jindal, Carly Fiorina, and John Kasich combined. Sanders is polling at 7.4 percent in the RealClearPolitics rolling average of national Democratic surveys, a figure that is sure to climb as pollsters’ continue their slow acceptance of a 2016 world without Elizabeth Warren and Joe Biden—a development that will leave the declared support of roughly a quarter of Democratic voters up for grabs. One thing you wouldn’t know from the ongoing coverage: Sanders’ polling is actually in the neighborhood of the GOP’s current second tier of Rand Paul (9.2 percent), Mike Huckabee (8.6 percent), Ted Cruz (8.6 percent,) Ben Carson (7.4), and Chris Christie (5.4 percent). Yet those guys have had no trouble securing their fair share of media coverage. With the possible exception of Carson, they are all taken seriously by the press. Now, it really would take a miracle for Sanders to overcome Hillary Clinton—by some metrics the most dominant nonincumbent in history—to win the nomination, and that’s information that reporters have both the right and the responsibility to share with readers. The problem isn’t that the media isn’t treating Sanders like a legitimate presidential contender; the problem is that they’re failing to treat him like a legitimate candidate. That’s a distinction worth making, particularly given all the digital ink spilled on the GOP hopefuls that also fall short of full-fledged contender status. Like Sanders, Paul, Cruz, and even Huckabee have no credible path to their nomination, let alone the White House. But unlike Sanders, all three are taken largely seriously by the national political press, and for good reason: They have significant bases. Paul gives a voice to libertarian-leaning conservatives, Huckabee to many evangelicals, and Cruz to some combination of the two. They don’t need to win their nomination to be worth covering seriously. The same should be true for Sanders. There is a clear thirst for his progressive message on the left. As my colleague Jamelle Bouie points out, Sanders’ economic agenda has an unquestionable appeal for many Democrats. Seventy-one percent want high taxes to fund programs for the poor, and more than a third blame the nation’s tax and economic policies for the gulf between the rich and the rest of us. Sanders’ calls for campaign finance reform coupled with his small-dollar campaign, meanwhile, are squarely in line with voters who back a constitutional amendment to counteract Citizens United by a 2-to-1 margin. And at a time when the country is arguing over the semantics about just what type of mistake the 2003 Iraq war was, Sanders stands out among his rivals for casting a vote against authorizing the invasion. Sanders doesn’t have the super PAC money, campaign infrastructure, or the political allies he’d need to win the nomination, but he’s clearly offering a worldview shared by a sizeable chunk of America. We don’t need to pretend he has a chance to knock off Clinton to acknowledge that.